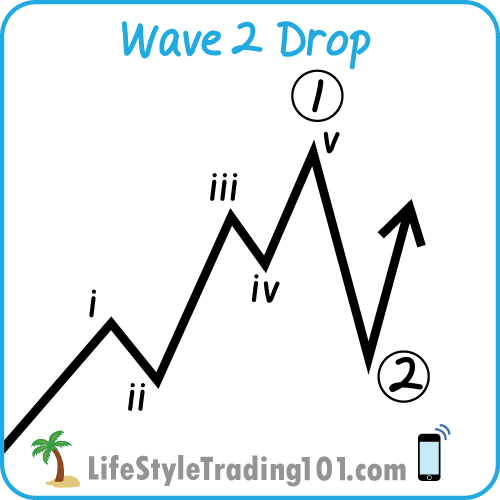 During a rally after wave 1 but before wave 3 – there is usually a significant wave 2 drop that retraces most of wave 2 before wave 2 begins. This drop usually just goes straight down without much chances to get out. …then, what follows could be the beginning of the 3rd wave up. Notice the wave 2 drop happens quickly and usually drops past below the wave 4 in circle but above the wave 2 in circle. It is not uncommon to retrace almost exactly 61.8% as it did in October 1987. 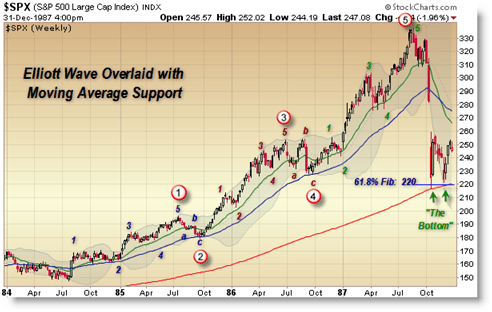 Notice the wave 2 drop in 1987 begins an even bigger and longer wave 3 bull market. Looking at the 15 min chart in this case made it easier to spot the pattern. 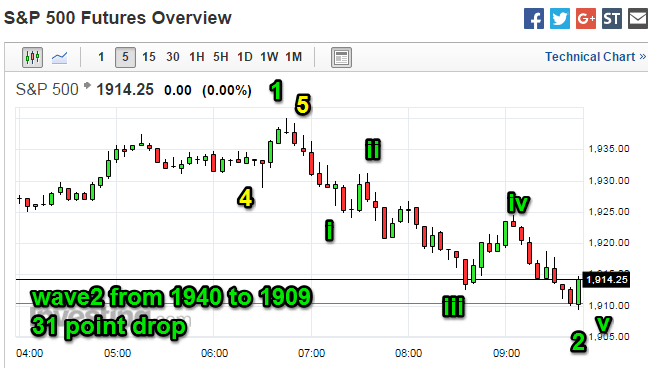 The market opened on a c-wave of 4th wave down, then 5th wave up – followed by the massive wave 2 drop. After the above – it still continued down. 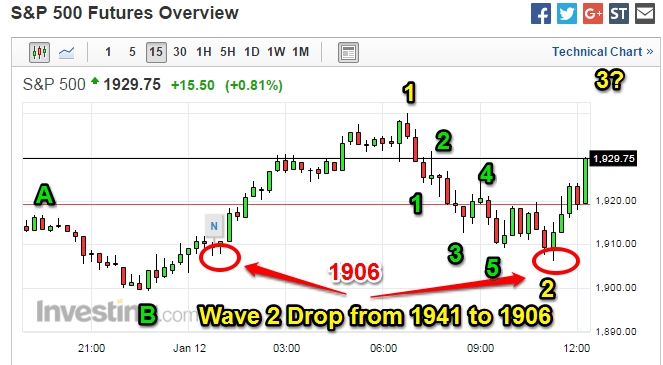 Here’s the final wave down (15 min chart)– towards 1906 before what appears to be a 3rd wave up rally — but until 1906 was tested. The lowest area for a wave 2 — is generally the bottom of the wave 2 just before the prior wave 3 upside — circled in red above. This wave 2 drop on March 17 happened overnight — so by 8:30am on march 17, the market was already trending up for another smaller 1-2- –before a more pro-longed wave 3 happened towards the close. Zooming in to that wave 2 drop, we see a subdivision of a-b-c where most of the drop happens in c.
This is a clue — but not a guarantee, that wave 3 may have begun. Retraces back towards 2077, may be buying opportunities. So the Brexit stock market “crash” from 2118 down to 1981 was completely reversed within 2 trading days from the bottom. The wave 2 usually drops below the prior wave 4. In the above case, the prior wave 4 was around 2010 — so it makes sense that the bottom of wave 2 should exceed 2010 on the downside. Initially it went down to 1999 within hours of initially touching above 2118 during the Brexit vote. It then rebounded above 2060 before dropping back below 1999 — this time towards 1981ES. 1981 was the low. Notice this Wave 2 drop appeared in the formation of A-B-C — in which the top of B reached towards the top of A – possibly surpassing it. In the Dow Jones — that B -wave did surpass it. And the trigger event here was the Brexit vote in the UK to leave the European Union. < And the low happened in an ending diagonal pattern.